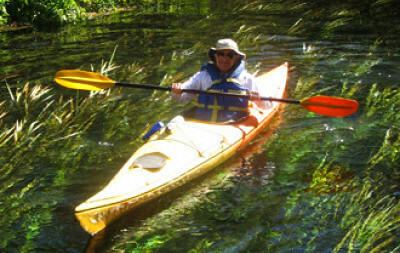 Kayaking experience is not needed, however, like most water based outdoor activities, participants should be in good shape and a strong swimmer. 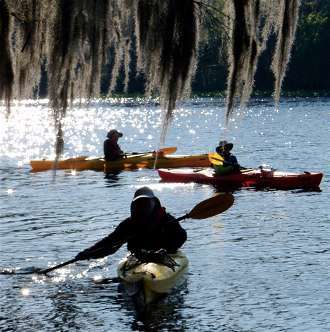 Located in the heart of North Florida’s vast forests lies hundreds of large magnitude crystalline springs that feed several outstanding rivers and waterways including the Santa Fe, Suwannee, Ichetucknee, and the Northern Withlacoochee. 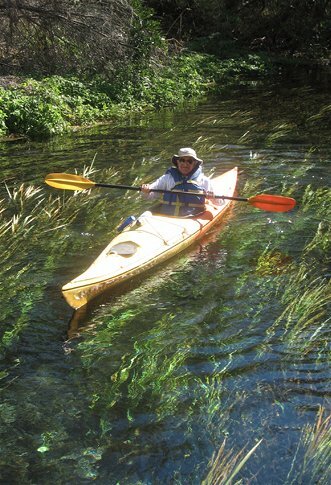 These springs were featured in National Geographic Magazine in March of 1999. Our base camp will be a brand new lodge at the confluence of the Suwannee and Northern Withlacoochee Rivers. 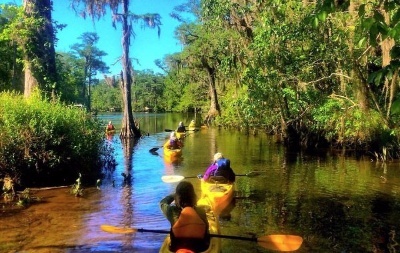 Over the course of the week we will paddle several scenic rivers, go tubing down a spring run, snorkel a host of large springs, and explore an area of Florida rich in history, culture, and unbridled beauty. The leaders will pick up all participants at noon at Orlando International Airport on the first day. Our meeting place is at the bottom of the escalators by baggage claim 5A. If for any reason your lost or running late please call the leader at 407 924-3375. The leader can only wait so long. We will then make the three hour van ride to our base camp stopping on the way at a restaurant for lunch (not included in trip price). Basic kayak instruction will be given after dinner on the first night. Each day we will pick a new location to explore. Depending on weather we might snorkel a spring to observe the remains of a sunken Confederate war ship or look for fossils and arrowheads. 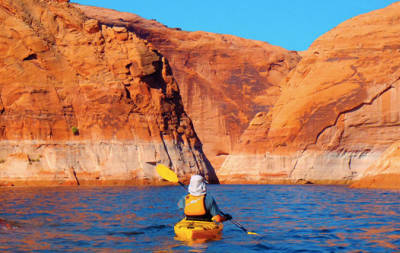 Other days will be spent paddling a gorgeous section of river with lots of opportunities to observe wildlife. 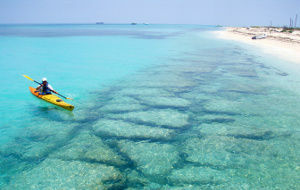 We will take our time on the water for swims, birding, snorkeling, and photography. 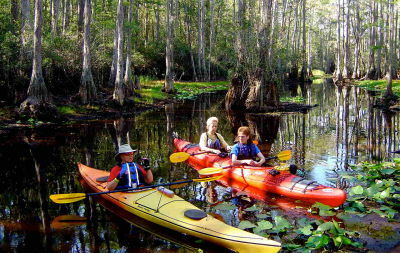 On short paddling days we will incorporate hikes on or near the Florida National Scenic Trail. Each day will present something new to do and see. In the evening we will return to our lodge for big dinners. Nights are reserved for swims, fishing, relaxing in the springs, or heading out for moonlight strolls. There is no set itinerary, each night at dinner the guides will announce the next days agenda and what to pack to enjoy the day. The guides are always available to answer your questions. 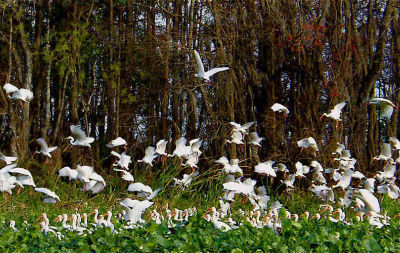 On the trips last day participants will be shuttled back to the Orlando International Airport around 2 p.m., meaning, all airline flights should be booked for after 4 p.m.
Not only is this area of Florida rich in wild beauty, it is also rich in history. For thousands of years Timucuan and Apalache Indians hunted and lived in these areas, leaving behind them tons of evidence of their presence. Pottery shards and arrowheads litter the banks of the upper Suwannee and Santa Fe. The Famous William Bartram explored this area during his “Travels” and wrote about it extensively. In the years prior to statehood, pirates would attack ships in the Gulf and hide up the Suwannee River. It’s a known fact that there is still buried gold at Fowlers Bluff. Scuba divers are always finding Spanish silver and gold throughout the river during low water. During the War Between the States, blue coats would hide along the banks of the river and attack Confederate steamers. There are still remains of such a ship at Troy Spring. Day 1 — Airport pick up, drive three hours to Suwannee River State Park stopping for lunch in route. Introduction to kayaking riverside. 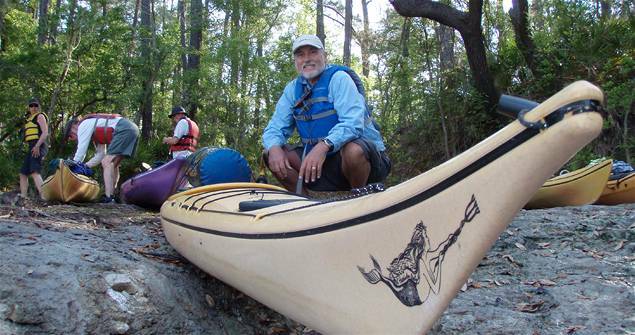 Day 3 — Suwannee River Paddle from the lodge to Dowling Park. Stopping at numerous springs, swings, and shoals. 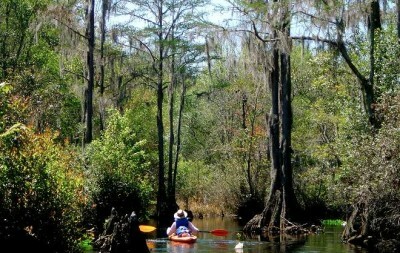 Day 4 — Kayak the Suwannee River’s “Spring Alley.” Float for half an hour, get out and explore a spring, repeat all day! On the way back to the lodge we will explore the world-famous Peacock Springs State Park at Luraville. 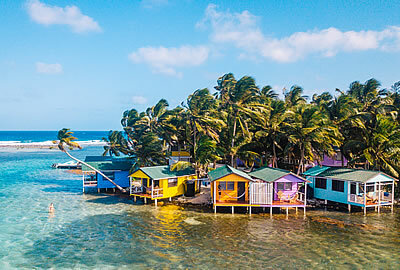 Don’t be surprised by the number of international travelers you may find at the end of the lightly-traveled dirt track, as people come from all over the world to scuba dive the vast network of underwater caverns found here. We will swim and snorkel the placid run between the springs. The amount of wildlife found in a clear water slough is so amazing and beautiful that you’ll want to swim the few miles out to the Suwannee. Day 5 — We start a little early today so we can be one of the first people on the water. The Ichetucknee is the ultimate tubing run in the world! Clear flowing water, sand bottom littered with fossilized sharks teeth, and the States Highest level of protection. Make sure to pack your snorkeling gear and underwater camera. Day 6 — A bit of a drive today, but there’s a huge pay off. We will be visiting the Wacissa Springs Unit and River. Hundreds of springs dot the riverbed creating a big crystal clear river with heaps of animals. Everyone gets a thrill from their first glimpse of a giant turtle, river otter, manatee, or small alligator swimming under their kayak. Day 7 — Sleep in! When you do wake up, take a walk, go for a swim or maybe a short paddle. Our van departs for Orlando between 10:00-11:00 a.m., with a 2:00 p.m. arrival at Orlando International Airport. Our lodging will consist of wilderness luxury. The lodge consists of brand new Cracker style cabins with wrap around porches that overlook the Suwannee River. There are full amenities, which include air conditioning, full bathrooms, kitchens, a large living area, dinning area, fire places and a porch with lots of swings. Rooms are double occupancy. The leaders will prepare all meals, however, everyone is expected to help clean up. Meals included in the trip fee begin with dinner on the first day and breakfast on the last day. Meals served on the trip will honor and reflect local cuisine. A typical dinner would consist of shrimp and crawfish étouffée, white rice, garlic bread, fresh salad, and something chocolate for dessert. People with special diets should contact the leader to make arrangements.